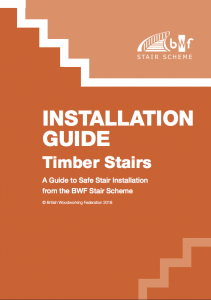 The new BWF Stair Scheme Installation Guide is intended to provide general information about installing timber staircases, focusing on key areas to ensure that the stairs are safe to use and not compromised by poor practice. The members of the BWF Stair Scheme design and manufacture their stairs so that they will support the necessary loads in both the flights and the balustrades, but poor installation can cause the stability of the stair to be reduced, possibly leading to premature failure of components and ultimately the collapse of the stair. The installation process itself has inherent risks and care should be taken to adequately support the stair until all the necessary fixings to the surrounding structure are in place. No stair should be used for access until its full load bearing capacity has been achieved and it is securely fixed in place. Getting the installation of a timber staircase right is an important safety issue. This new guide published by the British Woodworking Federation as part of the BWF Stair Scheme gives you all you need to know to make a good job of it.